Chris (27), Phil's son, is living in Lawrenceberg, Kentucky. Chris and his wife Tammy have two children, Noelle (4) and Tevis (2). Chris is in the home building business and Has just moved into his first house that he built! Way to go Chris! He is now starting on a second house that is on the property that he will sell. Sonya (26), Phil's daughter, lives with her man Bill in Nicholasville, and just recently landed a new job with the government working in the bankruptcy department. She and Bill live in an older 4 bedroom home that she is really enjoying fixing up. Jason (23), Jill's son, lives in Oklahoma with a room mate. He was engaged to be married, but due to irreconcilable differences they decided to part ways. I'm sure in time he will find the right woman for him, there is no rush Jason...take your time. He attends school, works for UPS in the evenings and a law firm during the day when he isn't at school. Niki (20), Jill's daughter, moved out of the house about 12 months ago and lives in a real cute 2 bedroom house 3 miles or so up the road. I'm so glad she moved back from Tampa, that was too far away! 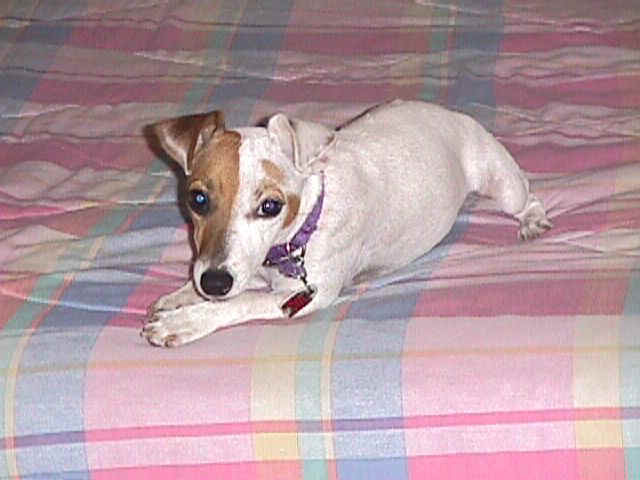 She has Alex, a Jack Russell terrier too! She works at Jesters (a sports bar) as a bartender and takes care of Alex in her spare time, a full time job she tells me! I told her to just wait until she has kids! Gabe (15), ours, is attending a boarding school this semester and maybe for the year. He is just plain lazy....we are hoping that this will motivate him to get back on track with his grades. He says that he realizes that it is important to have an education. Let's hope he means it. He was excited about being selected as the fresh prince for the homecoming court last year.